At the beginning of 2011, analysts everywhere championed a "renaissance" of nuclear power. The Japanese tsunami and subsequent Fukishima nuclear accident in March challenged market sentiment; spot prices and stocks alike suffered setbacks. The Energy Report has been there for the entire wild ride, interviewing industry experts, sharing sector news and scouting out the best companies for any market. Read on for a retrospective of expert commentary on this still-promising sector. 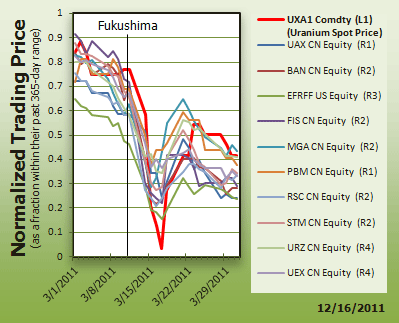 After a sluggish 2009 and a slow 2010, uranium seemed to be coming into its own at the beginning of 2011. The spot price went from $42/pound (lb) at the end of the decade to start 2011 above $60/lb. It quickly topped $70/lb in February and had $75/lb in its sights before the March 11 Fukushima nuclear accident slammed it back down briefly to $50/lb. With the exception of a couple bounces, it stayed lower through the rest of the year, closing at $52/lb. The Energy Report research shows that uranium company stock prices generally followed the spot price as measured in the UXA1 Commodity Futures Price (shown as the bright red line). The real low for almost all the companies—and the commodity itself—was in August and September, with signs of life returning in the fall. The week after Japan's natural disaster and subsequent nuclear emergency, we called then-Jennings Capital Mining Analyst Alka Singh for some context in the article, " Uranium Future Intact." "I'm still using a long-term uranium price of $75 per pound," she said confidently. "But, there is so much market uncertainty that I put off initiating coverage on uranium names because of negative sentiments people have surrounding this sector. I think that all of this is more emotionally than fundamentally driven. Actually, this is a great buying opportunity to pick some of the better uranium companies with the solid assets and management teams. I'm just waiting for the market volatility to slow down." When asked about how to spot the best opportunities, Singh had this advice: "The companies that are already in production with all their permits and most of their long-term contracts in place are the best companies to own right now. The long-term contracts have already been signed, so the utilities are actually paying the set price for the next five to eight years. Typically, companies that are already in production tend to sell about 70% to 80% of their production on these long-term contracts. Only 10% to 15% of their production is sold on spot prices. So, companies already in production with low cash costs and long-term sales contracts in place are the types of companies that you would want to own." Singh was not alone in her positive view of the long-term uranium market. In July, Mining Analyst David Talbot spoke about his continued bullishness for the market in an interview titled "Uranium and Lithium Demand Powers Stocks." "We remain bullish on the spot price of uranium," Talbot said. "In January, we said it was all about uranium demand and it largely still is. The demand picture hasn't really changed as much as the general media portrays. We might see uranium demand decline about 5% to 10% from where we predicted, by about 2020. But, we still expect about 240 to 280 million pounds (Mlb) of demand per year by then, which is really an increase of about 30% to 55% from here." In an August article titled "Catalysts, Not Uranium Prices, Grow Stocks," Haywood Securities Analyst Geordie Mark advised investors to forget about the price of uranium and focus on the strength of individual companies. "I think investors are looking for value within the sector. That can be translated as a company either witnessing good production growth potential, or nearing production having mitigated risk by receiving relevant permits and licenses. It could also be a company that has shown significant potential for resource growth. So, there is still investment potential. There is still interest in the sector, but investors are far more selective." Later that month, Frontier Research Report Publisher Carlos Andres suggested looking outside the usual sources for investments in an article titled "Uranium and Potash Stocks on the Frontier." "Emerging and frontier markets provide opportunities to buy high-quality companies at a discount simply because of the perceived risk factor," he said. "So we look at places such as Mongolia, which is a resource-rich country that is just beginning to realize the benefits of 20 years of market liberalizing. As a result, foreign direct investment has been steadily increasing, the rich resource endowment is starting to be developed and the country is experiencing historic economic growth. From a broader perspective, there are emerging and frontier market economies in South America, Southeast Asia and Africa with similar stories, although they all have their own unique twists. Countries like Colombia, Peru, Chile, Brazil, Guyana, Argentina, Ghana, Namibia, Tanzania, Botswana, Ethiopia, Indonesia, Papua New Guinea and others all play an important role in meeting historic and rapidly increasing global demand for natural resources." Andres acknowledged that investing in frontier countries is not without risk. "Mining projects around the world are confronted by governments that want a bigger piece of the pie and at worst might want to nationalize their projects. In addition, big, state-owned enterprises coming from China, India and others are looking to buy publicly traded mining companies outright. Thus, capital coming from the main public natural resource markets like Canada, the UK and Australia, has to compete with these forces around the world. It is impossible to say how this competition will play out in the end, but I don't think state-owned enterprises and national governments can run Western capital off the playing field because the mature natural resource markets in the world are in the West. The expertise for finding these resource deposits and defining, developing and operating mines actually rests in the West as well. They need Western capital, expertise and technology to operate effectively. A balance will have to be found between the giant state-owned enterprises from emerging countries like China and India, and Western capital, technology and management. How it plays out in the end is anybody's guess. But eventually market and geopolitical action will define the balance. It's probably safe to assume that in meeting their resource needs, behemoths like China and India will have to be content, at least to some extent, on being customers rather than owners." We checked in one last time in December with Dundee Capital Markets Vice President David Talbot for an article titled "The Uranium Industry Is Alive and Well." "I think we will come back to double-digit returns," Talbot predicted. The stocks actually had double-digit returns on three occasions this summer. But Fukushima put long-term viability of the sector in doubt for some time due to significant negative press, which kept coming, and often it was just wrong. Uranium and uranium equity markets now seem to be hypersensitive to negative news, and the spot price was declining due to supply concerns earlier this year. Stocks were trading hand-in-hand with uranium prices. We think that Fukushima ultimately is responsible for only about 30–35% of the value lost in the uranium equities while many of the stocks are down by about half." Then Talbot itemized the probably drivers for higher prices in 2012. "We believe that demand will really outpace supply beyond 2013. Uranium demand continues to be strong. Nuclear build continues to increase despite Fukushima and despite that the reactors are now offline in Japan and Germany. Today there are 12 more reactors in operation, under construction, planned or proposed than there were before the Fukushima incident. So that's about 997 reactors on the drawing board right now in one way, shape or form. We have seen uranium production increase about 28% over the past four years with almost all of that growth coming from Kazakhstan and Namibia. In fact, Canada and Australia are actually in decline over the same period. So despite this big runup in uranium prices from about $20 six years ago, we really haven't seen the mine construction that we had expected. Projects have been delayed, deferred or canceled for many reasons. We are estimating maybe just under 200 Mlb of production by 2020 if everything goes forward as planned. "Another important driver is the reduction in secondary supply resulting from the HEU Agreement, the downblending of the Russian nuclear weapons program and then selling that uranium for nuclear fuel. The HEU Agreement is expected to go offline by the end of year 2013, and the Russians continue to confirm this. The end of the HEU program would remove 24 Mlb from supply annually. That number is huge. It's about 18% of all uranium mining. That is definitely positive for the fundamentals."